Many service personnel return home from overseas deployment dramatically changed by their experiences, but, unlike physical wounds, mental health issues are less visible and can be difficult to manage. The transition from military service to civilian life is a complex process that involves various dimensions. For most veterans the process is smooth and well managed, but for some the return to civilian life is challenging. 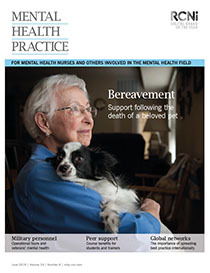 This article examines some of the literature on mental health issues that can affect veterans and discusses some of the ways in which mental health nurses can support this client group.